One of the benefits of having a long standing advertising relationship with Brownells is having access to catalog data as well as a deep familiarization with their product offerings. When researching updated website content for .22 pistol conversions I happened upon the HK HK P7K3 22LR kit. Now if you happened to click the link to the left you too will probably be taken back by the price tag of the kit. 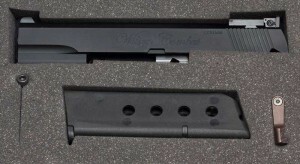 While I am quite familiar with the HK P7 the HK P7K3 22LR variation was unknown to me. I did a little research and found hkp7.com had the info that filled in the missing pieces. It turns out that while Brownells is offering a .22 conversion kit the HK P7K3 was originally a HK P7 designed to shoot three calibers .22 LR, .32 ACP, .380 ACP. Today these pistols complete with caliber conversions are selling in the $3500-$5000 range. At those prices I will never own one but as most know, money is know object if your a true HK fan . 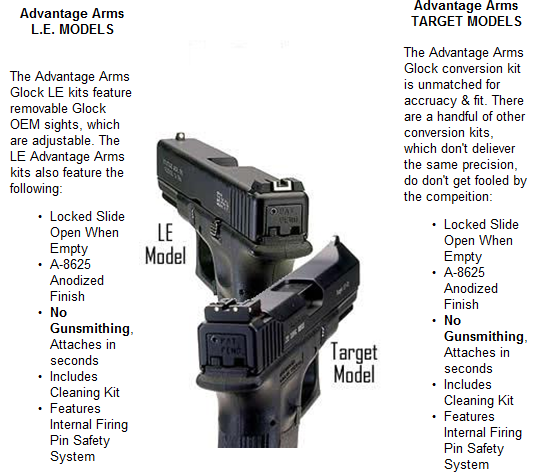 Anyhow according to the author at the site mentioned above the additional slide is only used when converting to .22lr. 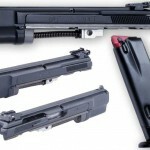 Complete conversion unit replaces the factory slide/barrel assembly without gunsmithing; lets you shoot inexpensive, high-velocity .22 LR ammo in any 1911 Auto. Feeds and functions flawlessly so you can get lots of valuable practice with the same grip and trigger pull you’ll be shooting in matches. Kit includes CNC machined aluminum slide and choice of 10- or 15-round magazines, plus match-quality steel barrel, recoil guide and spring. 1911 Standard Model (SM) includes vertical cocking serrations, round-top slide and fixed sights. 1911 Platinum Cup Model (PM) includes 60° angle cocking serrations, serrated, flattop slide and Millett adjustable rear sights. Extra magazines available separately. SPECS: Slide – 7075 T6 aluminum, black, anodized. Barrel – 4140 steel, black, parkerized, matte finish. Fits 1911 Auto pistols chambered in .45ACP only. 1 lb. (454 g) wt. 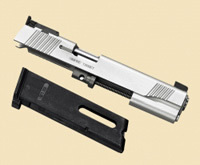 Accentuated Serrated Front Site Serrated Raised Flat Bar Top Angled Cocking Slots Millett Adjustable Rear Site Enhanced Accuracy Shooting inexpensive .22LR with your 1911 Style .45ACP is as easy as adding this top end assembly! And with most .22 ammo costing around two cents a round you can keep your skills sharp at a fraction of the cost. The slide is made of aircraft grade 7075T6 aluminum and hard anodized matte black. The barrel is Shaw Match Grade. This is a good little shooter and is a great way to introduce new people to shooting who may otherwise be intimidated by recoil. Includes fitted case, owners guide, and 15rd magazine. The Kimber Rimfire Target Conversion Kit, silver, adjustable sights, one ten round magazine included. Fits Mil-Spec 1911’s with 4-inch to 5-inch barrels, full size frame with traditional non-ramped barrels only. The Marvel 22 Long Rifle Conversion Unit turns any 1911 into an exceptionally accurate 22 caliber handgun. Installation is quick and simple with no fitting required. The barrel is machined from a Shilen blank, and the slide is made from 7075 aluminum with a hardened-steel breech insert to avoid any steel-to-aluminum contact. Aluminum parts are anodized and steel parts are blued for corrosion resistance. Will fit any Government, Commander or Officer 1911 frame. (Magazine will extend below the bottom of the grip on the Officer’s model.) 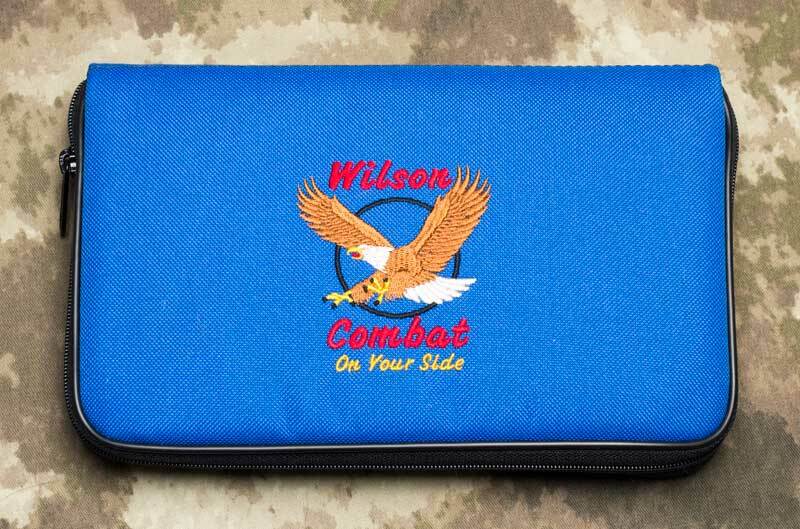 Includes one 10-round steel magazine and a foam-padded, soft-side nylon case. NOTE: The unit is designed NOT to lock open after the last shot. Factory rimfire conversion unit lets you shoot inexpensive .22 LR ammunition in your full-size pistol, so you can hone your shooting skills and save money at the same time. Easy installation, simply remove the factory slide, barrel, and recoil spring/guide and replace them with the rimfire unit. High contrast target sights feature one .1″ (2.5mm) diameter white dot front sight and two .08″ (2mm) white dots on the rear sight to form an easy-to-align, 3-dot sight picture. Rear sight is click adjustable for windage and elevation. Factory manufactured so you know it will fit and function properly. Slide is precision machined from solid aluminum billet and hardcoat anodized for durability. Includes polycarbonate 10-round magazine with slotted witness holes on each side for easy round counting. Removable base pad allows easy cleaning. Includes hard shell plastic carrying case. SPECS: Slide – Aluminum, black, matte finish. Barrel – Steel. Magazine – Polymer, matte black. 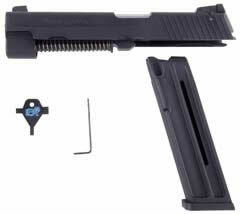 Includes: Slide, barrel, recoil spring/guide, 10-round magazine, rear sight key, and Allen wrench. 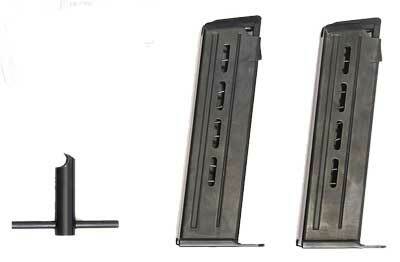 Fits P220, P226 excluding X5, and P229R with rail. The Advantage Arms Glock .22LR Conversion Kit is made to be ultra durable and light, featuring aluminum parts, which are later anodized and given a remarkable matte black finish. The steel parts are all heat treated and feature a flawless black oxide finish, so ensure your firearm doesn’t suffer wear and tear like many other conversion kits. The barrel is made from military grade 416 steel with a stainless finish for easy cleaning and precision.